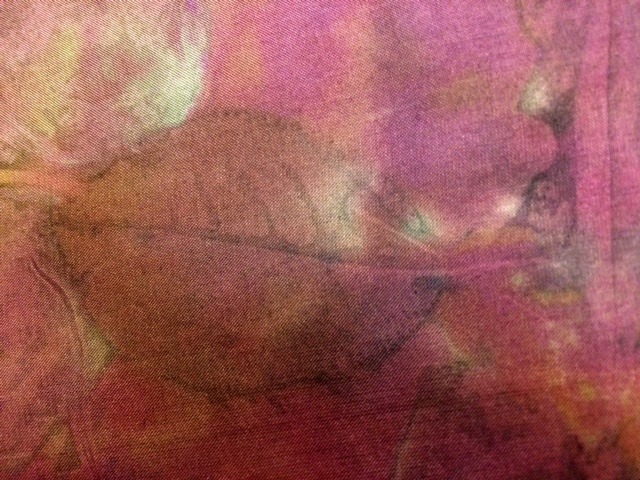 Eco-printing is a journey, more than a destination. It is a perfect project for the Infinitely Curious Person and a really frustrating project for The Perfectionist Person who wants standardized results every time. I’m the first one– the Infinitely Curious Person. It’s just that part of my curiosity involves wondering if I can standardize my results at least some of the time! 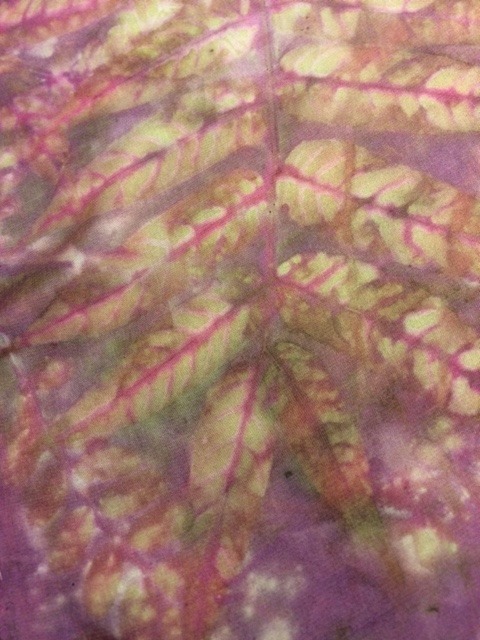 Some leaves print really reliably on fabric or paper, every single time. I can count on always getting some color from a Catalpa leaf, yellow, gold, green, or brown. Grape leaves? Nice, clear brown every single time. An oak leaf will always give me, at the very least, an outline of its shape or its silhouette in black. 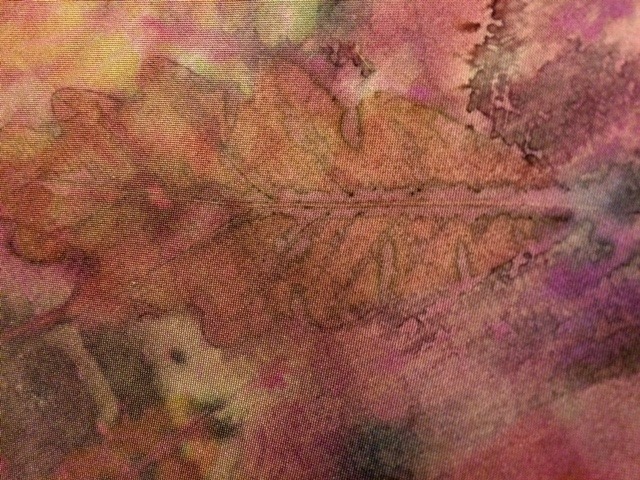 I’ve experimented, taken notes, used distilled water, steamed and not steeped, and tried to follow the instructions of successful eco-printers, yet still c an’t always get a print from a maple leaf. This week, I found a way to stack the deck in my favor. 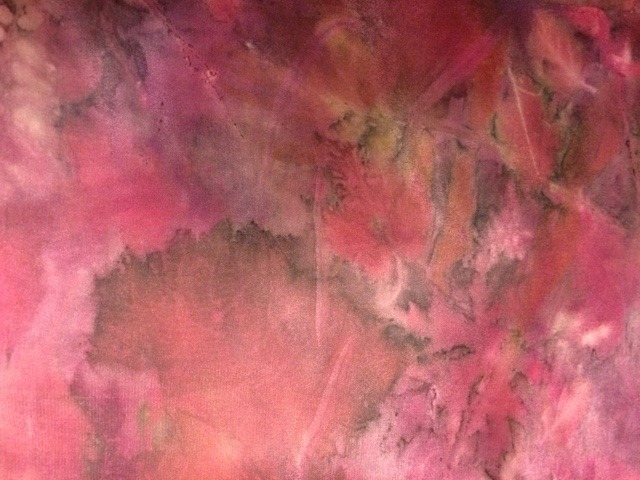 I know that “mordants” (from the French “mordre,” meaning “to bite”) will change the way natural fibers take natural dyes. But there are several other ways to influence the outcome of any type of natural dyeing besides the mordant. If the fiber is thoroughly clean — “Scoured” fiber hasn’t even got soap still in it. If the fiber has been pre-treated with an unknown chemical — Fabric softener, anyone? If the fiber has been mordanted — Yeah, I forgot that just today. I wondered why those two silk scarves weren’t taking the dye like the others. 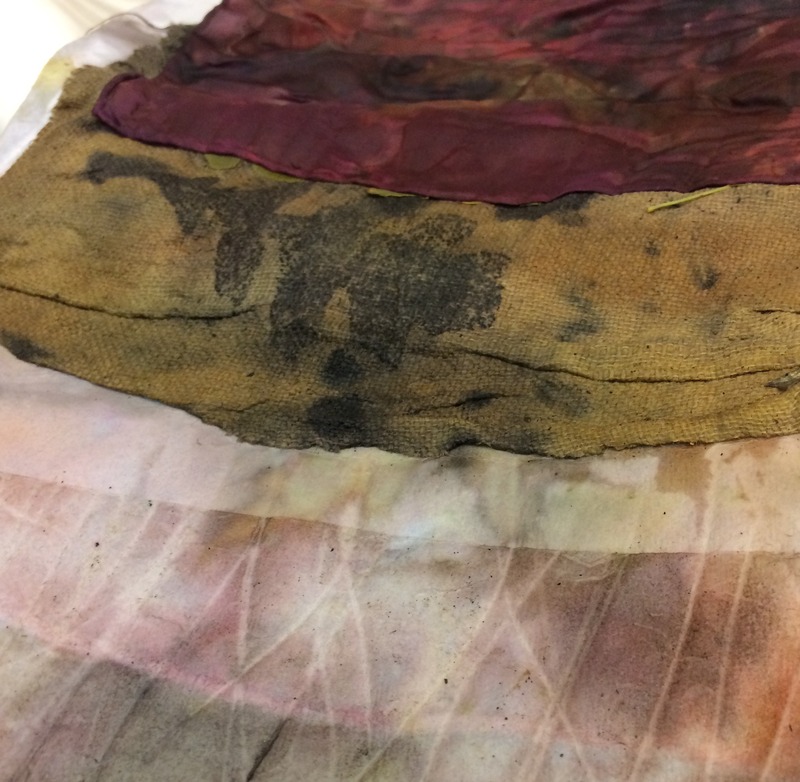 What type of mordant was used — You can completely change the color with your mordant! If there was enough mordant for the amount of fiber — I admit, I’m not big on measuring. What type of dye — Well, obviously, different plants (or bugs) give different colors. They don’t always come with labels on their box like the man-made dyes. Follow a good chart from a good source. 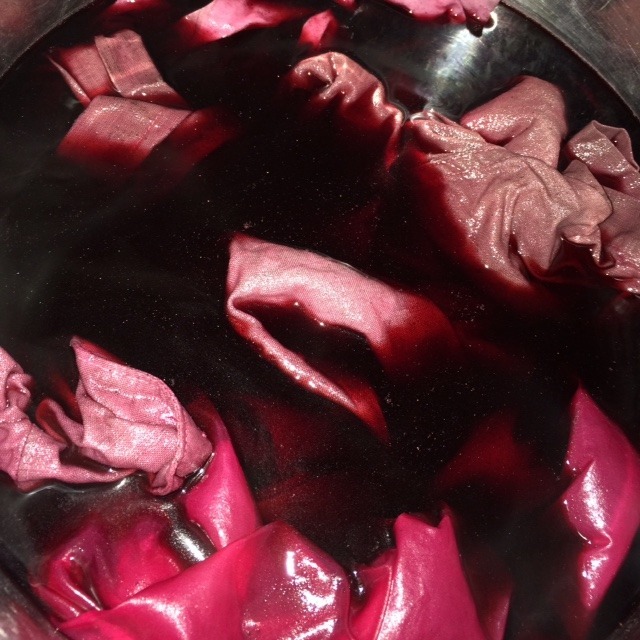 How much dye was used — A little cochineal goes a long way, but it takes a lot of onion skins to get a strong color. How did I stack the deck with this latest batch of dyeing? 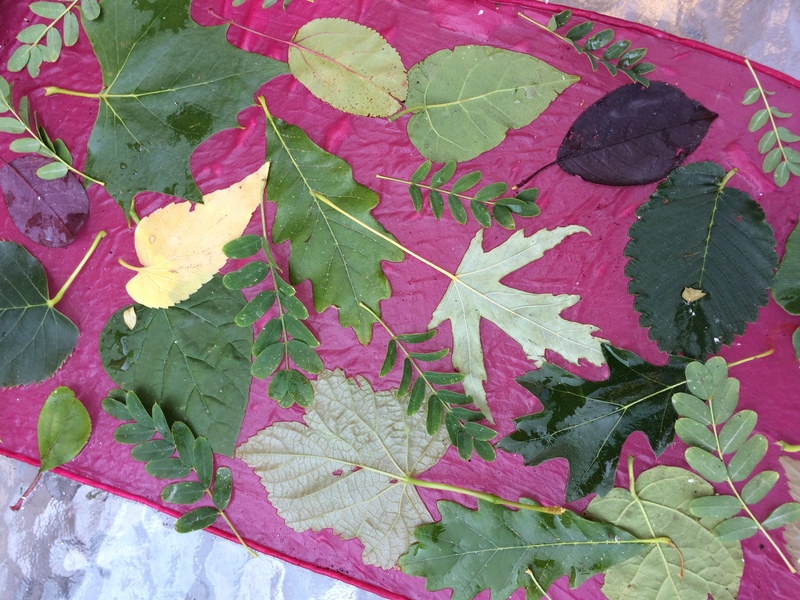 I gave every single variety of leaf a whole bunch of different variables, assuming that every single variety of leaf would give me some reaction that would show up on my fabric. I was correct. I scoured the silk. I also scoured the linen/cotton blouse I found at the thrift store. I laid out the fabric and composed leaves on it. I dipped a strip of old blanket into an iron solution. (Old sheets work, wool fabric works… in this case, this was one of those old, fuzzy, probably-acrylic blankets we all stopped using when microfiber was invented.) The iron solution is also another blog for another day. I layered the scarf, folded in half, into a sandwich of silk, leaves, iron blanket, leaves, then silk again. Here is a picture of it after unbundling. I found some old, heavyweight paper and put that on top of the sandwich. Again, you can see the paper in the picture. The string left marks on the paper, which can be a really cool intentional effect with this technique. I used a section of copper pipe (for the convenience of it, not because it changes the dye in my experience.) I rolled the whole sandwich onto the pipe, as tightly and smoothly as I could. Ever roll a sleeping bag? Like that, only much smaller. I bound the whole bundle with strong string. Then I steamed the bundle for 2 hours. After steaming, I let the bundle cool, unroll it, wash it, and iron it dry. What hap pened here? 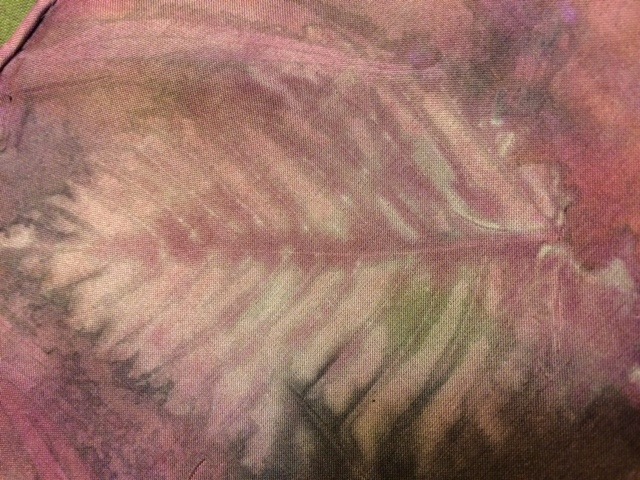 Some of the leaves dispersed the cochineal dye, some added color of their own, and some mixed their color. A few just took on the outline of the leaf, which is the magic of the iron blanket. Not a single leaf failed to leave some kind of impression on the fabric. 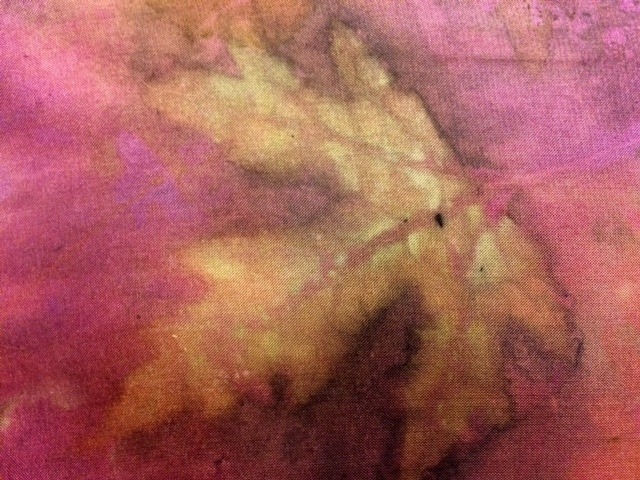 Even the maple leaves left a print, and they didn’t tell me if it was the pre-mordant, the dye, the iron blanket, or the fabric that made them decide to give me a print today. 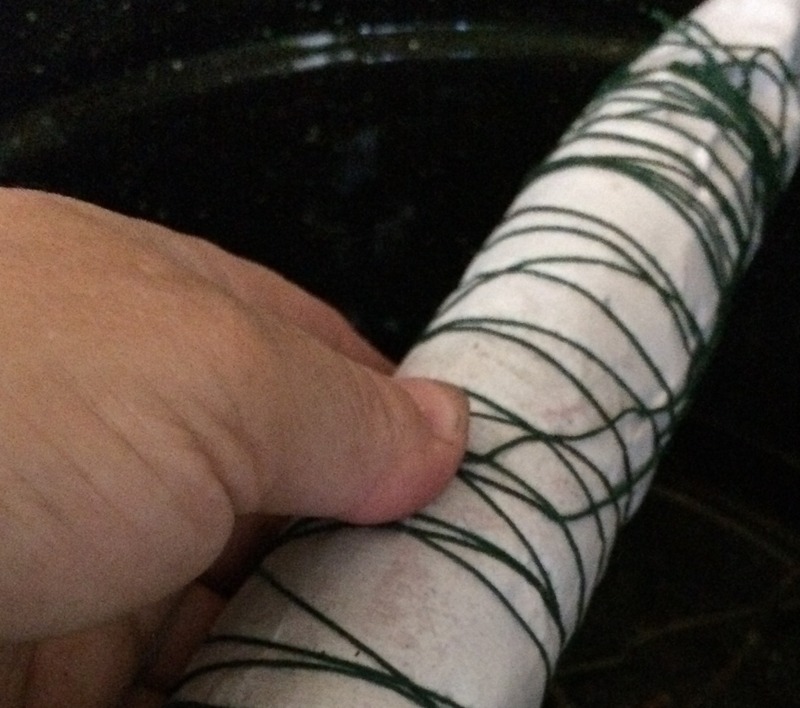 8 Responses to "Eco-printing with Cochineal: A Spectacular Combination"
This is very cool and didn’t know it was a thing. I think I will make it for my grandma since she loves nature. This a great idea for a Christmas present. Thank you! I love how you explained. Simple & easy. Doesn’t seem difficult for a beginner to do & I might make multiple ones for my other family memebers. It’s the homemade things that are the beat when you are giving gifts. It’s one of the hottest trends in arts and crafts this year! 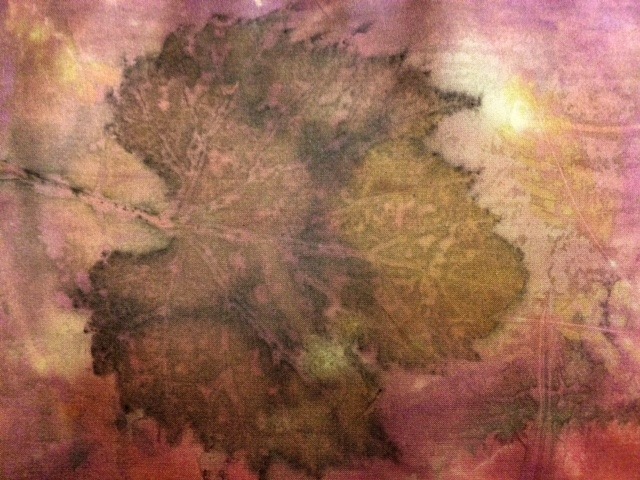 Since you’re new to eco-printing, be sure to read the blog post “How to Eco Print” first. It outlines equipment and materials. You can collect fall leaves right now and use them later, too. Just soak them in water first until they’re flexible. All I have to say is… wow! Thank you very much for your informative article. Great job printing all those types of leaves! You have saved me lots of time having to trial and pray. Mine never comes out as nice as yours, but I am going to try using the same products as you did and hopefully get the same result. Every single print comes out as a surprise! I’ve tried printing with a group of people, all using the same materials and leaves, steamed in the same pot, and every single piece comes out different. Wow! Your results are gorgeous! I have not done anything this complex but love leaves, pressing leaves, have dyed some of my own clothes etc. I would love to have the supplies to try this technique. I live in Alaska and we only have maples as domestic ornamentals not growing wild but we have a ton of other leaves to choose from. I would use birch, alder, and especially quaking aspen leaves as well as numerous ornamentals like the maple and mountain ash. I wonder if you could do the same technique with large flowering grasses? Thank you for sharing this process and your amazing photos! Wow, your website is so cool. I loved reading your article. It was really informative. My mom is really into eco printing. She already did with some of her clothing, but I do not think she never used cochineal. Which give me an idea. I will recommend checking your website to inform herself more about eco printing. Thank you once again. Really appreciate your article. Thanks, Strahinja! 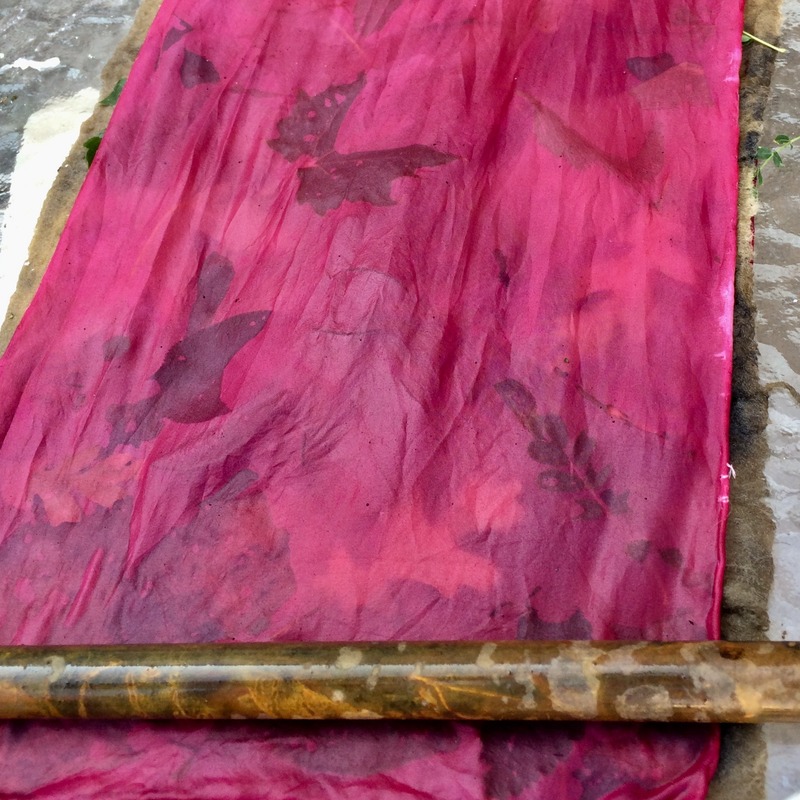 Let your mom know that eco-printing over turmeric, logwood, or Brazilwood dyes works in the same way as cochineal. Those little bugs are expensive and not available all over the world– unless you get them on Amazon.